Glad You made it to Talk Morgan again. I have found many old friends here as well as some new ones. A warm welcome back from "downunder"
Welcome Rovert. Myself and Lady HB have often stayed in Jersey- lovely place and fun to drive around. Caught by accident the air show once and remember some fairly old Russian plane basically flying so slowly against the wind that it was almost static in the sky. Is it true that I hear the Mansell museum has gone? I enjoyed hearing Nige’s cheerful tone on the headset last time we were there. Welcome. That sounds like a nice roster of cars. Orange and Chrome Purple, cripes. OK will do my best. OK that seems to have done it, this is taken at a local timber merchants, I was collecting some pallisading, I can get more in the Mog than the Land Rover! Yes, at the moment I'm afraid it is. If you buy a car from his son's car dealership, I understand that they will offer you a private tour of it at wherever it is being stored. It would be very pleasant to give you a tour of the Island Peter although, as you say, the roads can be a little err character building. That is one of the reasons my other car is a Land Rover Defender so I can see what is coming around the corner. 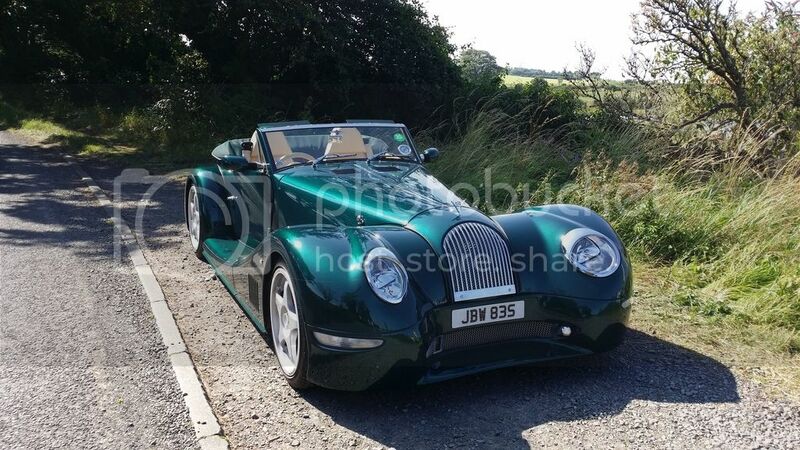 Lets hope that the new Wide-Body Morgan is wider on interior space rather than overall width otherwise any potential owner here may be a bit limited on the roads here. Hello from belgium. Nice color combination. The Aero +8 is about 6" wider inside than the roadster we had before. It also has a poor lock, thanks to the 225 width front tyres. But the ride is so much better, and the power, oh the power. The local Morgan group who took us out seemed have a bit of a relaxed view of the local speed limits once out of any built up areas. But it was fun.....!! By Jove, you are absolutely correct. Just did a bitta looking around on the interweb following your suggestion and i think it was the AN - 2 - thanks for the tip. That really is a stunning colour combination. I wonder if Tvr people will cancel or have done already their order for the new Griffith which has again been delayed and bought a Morgan ? I reckon you could also build quiet a few body frames with all that timber! Thank you for the complements on the colour. My choice, but not my "design"
When I ordered my Cerbera, I chose the colour from a 2" square sample, the result was a rather uninspiring "Nail Varnish" Maroon. Therefore when I was specifying the +8 I had already made the decision to go two-tone, but was not going to risk choosing a colour from a small paint sample again. So I asked on another forum for examples of two-tone cars. The response was pretty impressive and I ended up with a library of over 80 colour photos of two-tone cars. The end choice was between this combo and Black and Silver, obviously I went for the Blue. I then contacted the owner of the original scheme who was pleased that I had chosen his scheme and very kindly provided me with paint colours. Very sadly his car was destroyed in a crash and fire that nearly took his and his wifes life about 2 months after mine was delivered. He did however manage to persuade the MMC to build him a new body shell in the original colours. That car is now very well known in Mog circles. It is the Phoenix owned by Lorne Goldman of GoMog fame. Interesting thought Madmax. I am not sure that TVR buyers would be into the trad market. I certainly wasn't until I started to get involved in the Morgan "culture" via my original order for the Aero. However the new cars may be attract different market. I do hope the TVR does materialise at some stage though. When I ordered my Cerbera, I chose, the colour from a 2" square sample, the result was a rather uninspiring "Nail Varnish" Maroon. My +8 Bitsa has many parts, including the front wings, from Lorne's damaged +8. He had the undamaged parts preserved and shipped them to Me. How I got the other parts for this +8 is a story in itself. That is a story that needs telling Bill. Another Photo of Brian's car from one of our trips to France.